Oregon State University maintains one of the nation’s leading programs in radioecology, the study of the long-term impact of radioactive isotopes on the environment. Research on this topic goes back to the 1950s when agricultural scientists at OSU and elsewhere in the United States were confronting questions about how to manage radioactivity in the environment. The specter of nuclear technology gone wrong haunts the Pacific Northwest. From recent radioactivity traced to Fukushima to issues with waste containment along the Columbia River at Hanford, Washington, citizens have good reason to be suspicious. Radioactive materials can benefit society in many ways: They are used to produce carbon-free electricity, to diagnose disease, and to identify combustion products in smoke detectors. However, opinion surveys reveal strong disagreement between scientists and the public about the uses of nuclear technology, especially when it comes to energy. At Oregon State’s Special Collections and Archives Research Center, an exhibit, “The Nuclear Age: Seventy Years of Peril and Hope,” bridges the gap between science and public. The documents on display give life to many little-known stories from the early days of the atomic era. Frederick Paulsen’s Plant Mutations and Radiations (1960) details the applications of the atom for farming, and a report for the Atomic Energy Commission (AEC) from the University of Tennessee reveals that agricultural scientists could use radioactive tracers (unstable elements intentionally introduced into an organism or into the environment) to find out how fast roots grow, how soon water gets to them after the rain and how long it takes an animal to fully digest its food. Radioactive particles can be measured to help researchers map the internal systems of plants and animals. Experimentation during this period went beyond radioisotope tracers, which continue to be used in laboratory and medical studies today. In a recent paper, Oregon State Professor Jacob Hamblin follows the journey of mutation plant breeding from its roots in the United States in the 1930s. Like something from a Mary Shelley novel set in a nuclear dystopian future, American scientists used radioactive materials to mutate the genes of tomatoes, corn and other fruits and vegetables. They believed that radiation could unlock the potential of the genome for the benefit of mankind, speeding up the very process of evolution itself. Hoping to fill the fields of the United States with their atomic progeny, scientists such as Arnold Sparrow at Brookhaven National Laboratory in New York worked with almost no information on the dangers of long-term exposure to radiation for humans or for the environment. Within a decade, the development of mustard plants with high yields of vegetable oil and “Ray Peas” (as in, ‘X-Ray’ peas) with unnaturally large pods were heralded as successes in humanity’s control of the progressive force of evolution. American botanists even brought seeds of barley, wheat and oats to atomic bomb tests in 1946, planting the irradiated seeds back home. These projects were usually not successful, and not everyone was interested in the new approach. Hamblin argues that, in fact, most plant breeders were far more interested in studying and hybridizing existing plant varieties than in mutating new ones. Scientists at Oregon State were skeptical, even though they surely believed in the power of the atom for science. Chih H. Wang, chemistry professor and head of the Institute of Nuclear Science and Engineering, spearheaded the founding of the Oregon State Radiation Center in 1958. By 1961, progress reports were piling up for a project titled, “Radioactive Tracer Studies in Intermediary Metabolism in Fruit.” With AEC funding, the departments of chemistry and horticulture conducted tracer studies at OSU using a method Wang and his colleagues developed to study metabolic pathways in tomatoes, peppers and peas. Plant metabolism research using radioisotopes had been underway for years, with studies of the metabolism of complex sugars in plants resulting in strange examinations such as waving a Geiger counter over avocado leaves. Research conducted under Wang included animal studies as well. In one project, the effect of x-ray irradiation on several cellular processes was studied in rats. Another experiment determined the biological half-life of radioactive selenium by introducing the isotope to pigs through their feed and monitoring their excretions. While some of these studies might now be considered hazardous, scientists at the time were often trying to better understand the dangers of radiation and other pollutants. In 1963, OSU cell biologist Frank Conte received a federal grant titled, “Effects of Radiation on the Migration of Salmonids,” specifically steelhead trout and silver salmon. He realized that radiation might not be measurable simply in population decline; it might impair the development of important biological characteristics — seaward migration or spawning, for example — potentially stalling the life cycle or causing the extinction of the species. Interestingly, the study proposed to use radioactive tracers to study these metabolic and hormonal changes in the fish that they were concerned might be affected by pollution. The reliance on radioisotopes for such studies began to decline in the late 1960s. In a 1968 letter to Wang, Joseph Jensen of the Oregon State Sanitary Authority expressed interest in a proposed pollution tracer study through the OSU Environmental Health Sciences Center. Wang explained that the project would track pollutants in the Willamette River with rare metals, such as scandium and yttrium. The goals were to measure the natural concentration of chemical elements in the Willamette River from Springfield to the Columbia River and to determine the fate of pollutants from effluent discharge points. In this case, the team would be measuring stable rare-earth elements as tracers that would not introduce “any detrimental effect to the environment.” They called this the “rare-earth spiking method,” because it required researchers to add minerals to the source of effluent, much as one would spike punch. 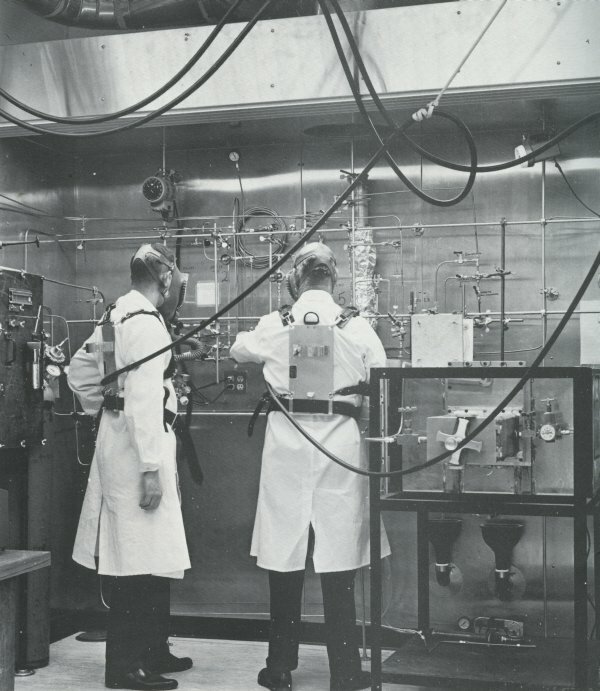 Radiation scientists at Oregon State lived in a time when atomic power was promoted as a road to a better tomorrow, even by mutating of plant species to produce better crops. Yet they remained cautious, largely conducting research that placed its emphasis on the well-being of the people of Oregon and of the land around them. In the years following the Nuclear Test Ban treaty and the awakening of the environmental movement signaled by Rachel Carson’s Silent Spring, the seeds of ecological awareness can be seen in the history of Oregon State’s nuclear program. Today we look back on the history of nuclear science at Oregon State and in America with both a critical eye for the hazards involved and an appreciation for the fact that many of these studies sought to understand how to prevent the damages of pollution and radiation in the environment.